Safari Town, SA – These Two Eyes! When I think of safari, I imagine exotic destinations written about in high society travel magazines. I envision myself sipping wine in an outdoor bathtub overlooking the savannah as a fire burns quietly and there are endless shining stars in the sky for me to count. Every now and then I would perhaps hear a loud roar in the distance and then giggle to myself before indulging in chocolate-covered strawberries. 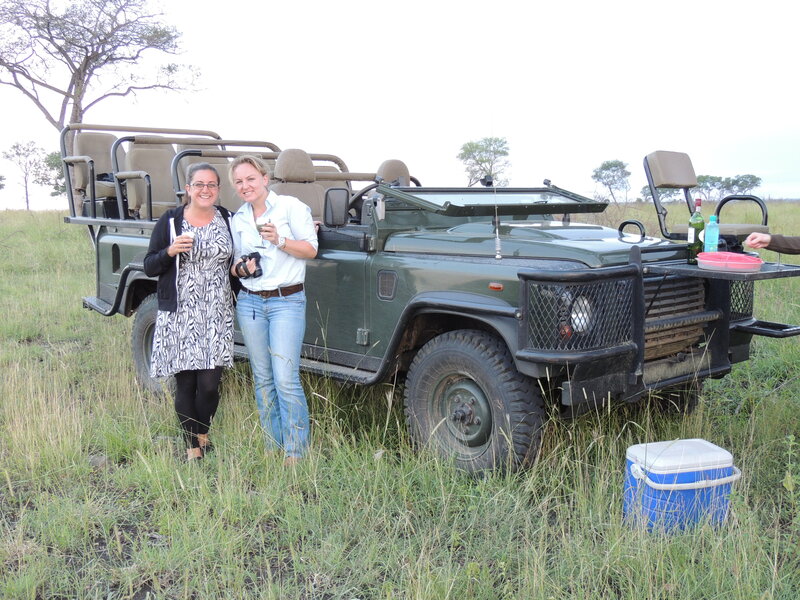 These daydreams of being catered for on hand and foot, being served the most exquisite dishes, no rush of tourists, no commercial noise – they weren’t exactly my first safari experience but then again, they also weren’t too far-fetched. There are thousands of safari destinations, camp sites, reserves, game parks and tours within South Africa from self-catering to luxury and choosing the right one, within our budget may have proved to be a challenge. See, I wanted the almighty picturesque safari and I was willing to pay for it – erm, as long as it didn’t cost more than $1,000 that is. When it comes to South African safari the head honcho is Kruger National Park. Nearly 2 million hectares in size, or similarly the same size as Wales or Israel, Kruger is one of the most sought out destinations to view the Big 5 (lion, African elephant, Cape buffalo, leopard, and rhinoceros), as they are the most difficult animals to see in the wild. Because Kruger is open to the public, it means anyone can drive in for the day. Visitors must stick to the roads and cannot get out of their vehicles, which must be fully enclosed. The one advantage is if someone see’s something you immediately know it because the cars pile up each waiting their turn to view. 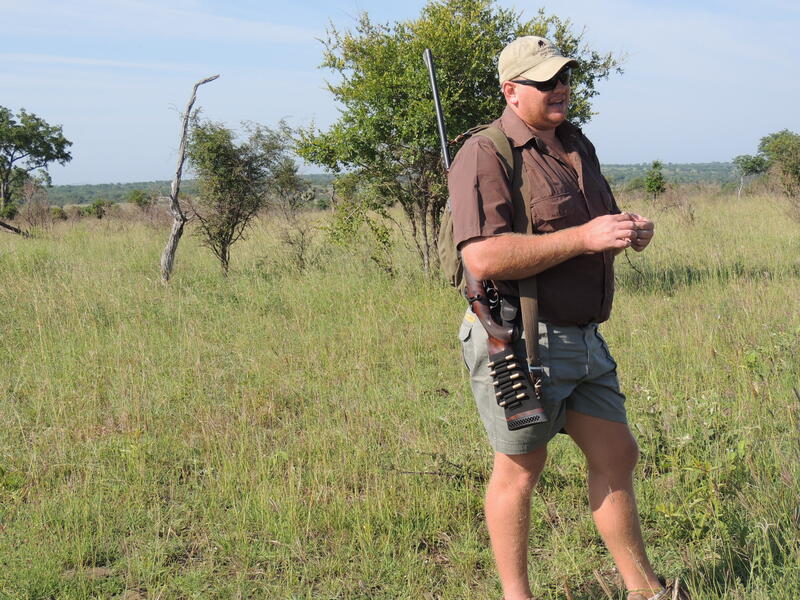 The alternative to Kruger is visiting a private reserve. On the private game reserves the landmass is a lot smaller and the number of animals is limited. But, the advantage is because it is private accessibility is restricted only to those who have a stake in the reserve. This means that depending on which you choose, you’re less likely to witness another vehicle and the rules are a bit more lenient. 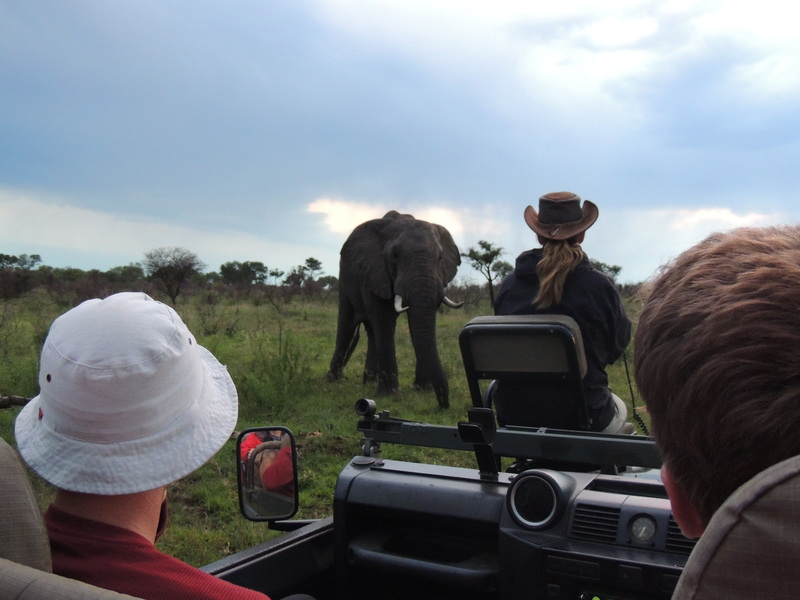 For example, you can take an open-air vehicle off the road and go directly up to the animals as well as under the appropriate conditions conduct walking safaris. So with all of this to consider, how on earth were we meant to choose? I found the website www.africanbudgetsafaris.com which helped us narrow down our options, taking into account our budget, time frame, and interests. At the end of our search we found the perfect match: 3 night/4 days with Tydon Safaris which combined not only Kruger National Park but also drives in the famous private game reserve Sabi Sands with stops along the Panoramic Route on our return to Johannesburg. The best of everything we wanted. I had my outfits planned perfectly. Each day I would wear a different animal print. I mean, going on safari is literally a once in a lifetime must-do. If I am going to be one with the lions I would like to truly blend in. So that’s what I did. Mark from Tydon picked Jaime and I up from our overnight accommodation Mo Africa in Johannesburg to begin our prolonged 6 hour journey north. The air conditioning in the mini-van was a relief from the northern heat as we settled in for our trip, making friends with the 2 young Irish couples also joining the safari. Another perk, Tydon only has a total of 6 tents so the personability of the tour was fantastic. On our way I sat in the front and inquisitively asked Mark every question under the sun about close animal encounters and safety. I was already starting to get a reputation as the uneasy one but didn’t mind a bit. Better safe than sorry if I came face to face with a lion! And with that, we stopped for lunch at the Wild Fig Tree Café, a little more than half way there in the small town of Sabie where I indulged in a traditional Afrikaans potjie. A few hours further north we were driving along the Sabi Sands gate approaching our destination and instantly spotted a rhino just next to the fence. My heart began racing and the excitement set in as it finally dawned on me that, “My gosh, I’m on safari!’ A few minutes later we pulled into the Tydon Safari grounds to be greeted by owner Gavin and shown to our tents. Let me be clear when I say tent. What I actually mean is a Harry Potter-esque tent. Tydon was the perfect option of affordable luxury, for normal people. 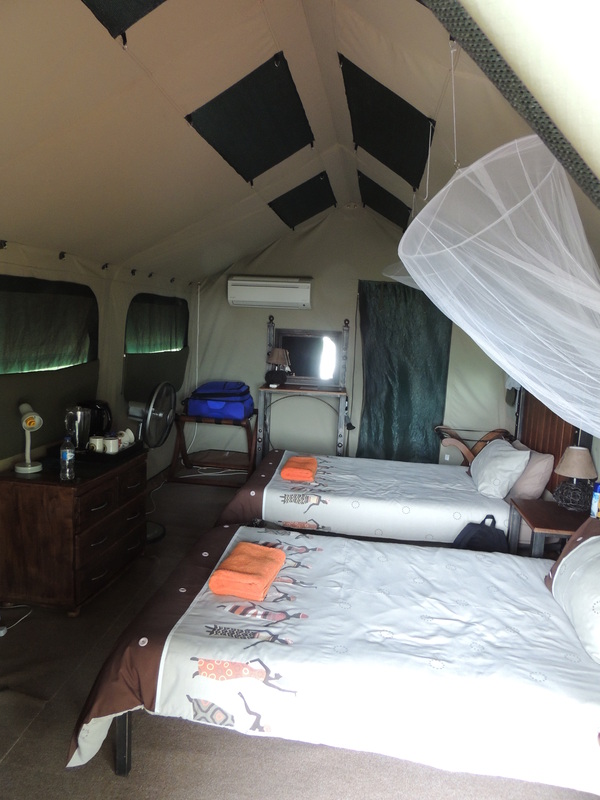 Our large canvas tents contained two single beds with mosquito netting adding a scenic touch, carpet, luggage stands, and a bathroom housing a glass enclosed shower with porcelain sink and toilet to top it off. So there was no bathtub overlooking the savannah, that’s okay because there was air-conditioning. The modern day term for this is “glamping,” or glamorous camping. No time wasted, 4 pm sharp we boarded the jeep for our first drive. Although the jeep was fully open on top, no guns are required for the drives, only for walks. We began our journey into the bush, eyes glued to the wild seeking out whatever animals we would stumble across. That night we saw zebra, waterbuck, wildebeest, impala, kudu and various birds. At sundown the jeep pulled into an open area and we all got out to enjoy ‘sun downers’. Wine in hand, we watched the sun set, nibbling on dried meats and nuts, listening to the sounds of the wild around us. The backdrop was absolutely stunning. Thank goodness there was a full moon that night because once the sun went down it was pitch black. One of the guides sat at the front of the jeep with a huge spotlight shining it into the woods while we were meant to keep our gaze out in case we came across something, the key being to look out for glowing eyes. It was almost peaceful, driving in almost complete darkness and silence. At times my mind would wander and it would take a second to snap back to reality before realizing I was in the middle of nowhere in Africa scouting for animals in the dark. At one point our guide shut the car off and we just sat there for a few minutes quietly in the darkness watching fireflies light up all around us. I’ve never witnessed anything so magical. The most striking highlight was coming across a giraffe silhouetted against the moon. When we returned to camp the fire pit was lit and individual tables and chairs were arranged in a circle surrounding it. 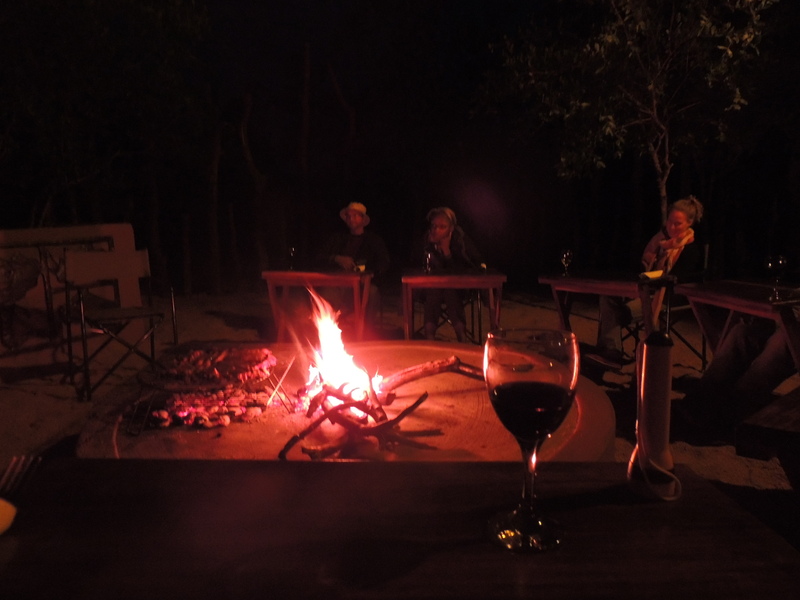 The owner Gavin joined us for a traditional Afrikaans meal as we sipped wine and shared stories around the camp fire. At that moment this was the fantastical safari I had always pictured coming to life. The night was short however as we had a 4:30 am rise for our next safari into Kruger the following morning. After our early rise we were met with tea and coffee before getting in our closed-top vehicle for Kruger. I was excited, as Kruger is meant to have the most diverse population of animals. On first sight it even appeared to look different then Sabi, with longer grass mixed with deeper bush. I mentally pressed play and the Lion King’s Hakuna Matata was on repeat in mind as we scoured the land for the Big 5. 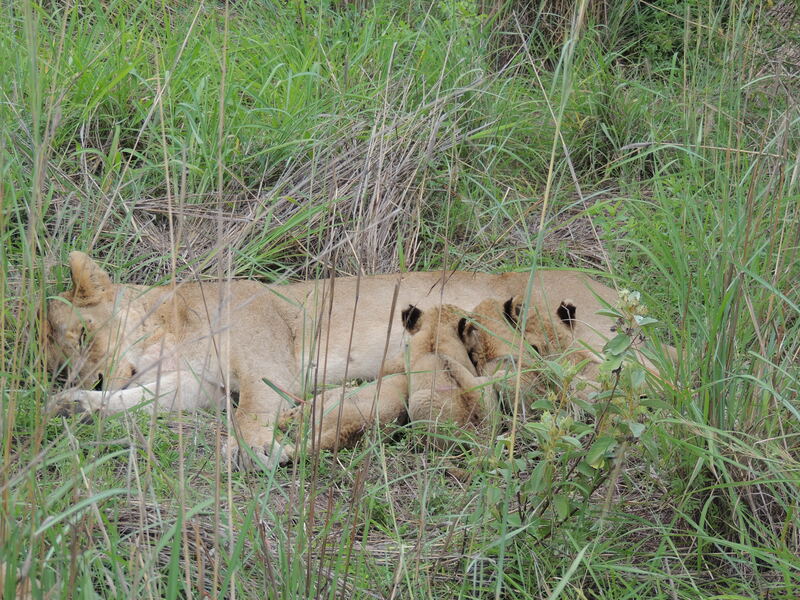 We were in luck because the radio called in a mama lion and some cubs not too far off! I was surprised and impressed by Kruger. Because it is public I had expected the masses, almost like a larger version of Disney’s Animal Kingdom with oodles of tourists. Yes, we did see other cars and specifically at the lion there was a bit of a back log however for the rest of the day it was just us on the open road. We saw 4 out of the big 5 that day and made it our personal mission for the rest of the safari to come across a leopard. On this day we saw cheetah, rhino, elephant, lion, zebra, monkeys, giraffes, tortoise, buffalo, hippos and more impala. 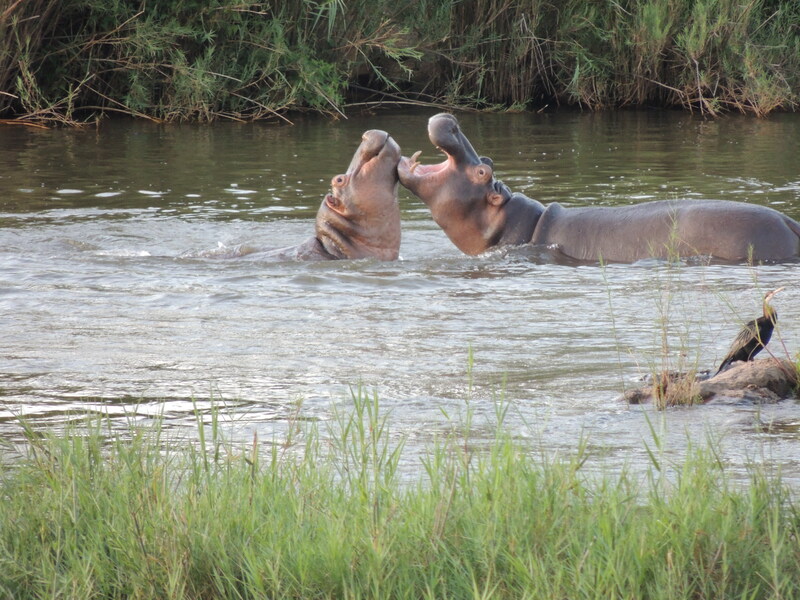 The hippos were not in tutus as I had secretly hoped from my childhood days watching Fantasia. Every mosquito that I swatted or bite that I bitterly scratched my only thought was – Dear God, please don’t let it be malaria. Luckily, each night before going to bed Jaime and I would take our malaria medication as I would sing the song I wrote for the occasion, “Ma – ma – ma – malaria!” And it must have worked because we are both to this day malaria free. On our last day at camp we were in for a real treat – a walking safari. This was typically only arranged for longer stays but we were fortunate enough that the schedule got changed for the week we were still there. Over dinners the previous nights I heard stories about cars being flipped over by elephants, poisonous snakes found under lounge cushions, rhino’s mauling hikers. Humph. “How safe is this walking safari,” I wondered and asked aloud. Steve drove us out to Sabi and once out of the vehicle explained how it would work. He would lead in front, as he was the only person with a rifle, and we would follow single file with Jackie from Tydon taking the caboose. There was to be no talking. If you saw something you were to whistle. Easy enough I thought. As we walked along we didn’t see much at first and Steve would stop every few minutes or so to describe a bird or bush or some other natural wonder. The idea of the walking safari is that we were in very low bush so we could see a wide radius around us. Shortly after moving along Steve had us stop as he took out his binoculars to evaluate the situation. Just as suspected Steve could see 3 rhino’s up ahead. The good news is we would get to experience this magnificent spectacle. The bad news is that if the rhinos caught wind of our smell we were in trouble. We were still a great distance away and Steve deemed it safe for us to travel a bit closer to get a better look. Closer? What do you mean closer? But I followed the group and we inched our way close enough to see them not too far in the distance. We huddled behind a barren tree trunk, one person at a time allowed to step out to take a photo. But then Steve got a bit nervous. He felt the wind change and thought the rhinos may be able to smell us. We had to retreat. As we were in low bush there weren’t many trees around for us to hide behind. Quickly, but without running or making any sudden movements we inched our way away from the dangerous animals. We wouldn’t be able to take the same route back to the jeep at this stage. Steve suggested we take a wide perimeter to play it safe. What?! How much potential danger are we actually in, Steve? Taking a wider perimeter meant that we would have to go deeper into the bush and wouldn’t have the safety of the low grass around us. Steve walked ahead of us with the rifle out in front of him. Around various curves he would disappear for a few minutes then wave us on. He instructed everyone to be fully alert and look both left and right while walking. If you saw something, you were instructed to whistle and whistle loud. Seriously? This wasn’t ‘just in case’ anymore; we were actually walking through the African savannah. At any point there could have been a lion or leopard taking a snooze next to where we were about to walk. Thankfully it only lasted for about 15 minutes. We came across a young zebra aimlessly gallivanting at one stage which was a beautiful thing to watch. I was very thankful once we made it back to the jeep. Once in the jeep we were able to drive right up to the rhino, literally 10 feet away, the same ones that a mere hour before could have claimed our lives. We had one more night safari that evening in the pouring rain. Of course I was anxious that we would get struck by lightning. Walking away from this experience was one of the most amazing things I had ever done. Until coming to South Africa it hadn’t previously occurred to me how adventure stricken and fear facing this trip would be but I walked away with a smile on my face and new confidence gained. Loved it Sister!! Elephants!! You’ll have to send me the one with the two elephant-butts for the guest room. So cute. What an amazing trip…Never thought I would want to go on Safari, but it’ll be on the bucket now. Thanks Michelle! There are tons more elephant photos on my facebook album as I only picked a few selected shots for the entry. The elephant bums are all yours though! Join me on my next safari, I smell a fam jam!